InfoQ.com is facilitating the spread of knowledge and innovation in enterprise software development. InfoQ content is currently published in English, Chinese, Japanese and Brazilian Portuguese. With a readership base of over 800,000 unique visitors per month reading content from 100 locally-based editors across the globe, we continue to build localized communities. Web APIs are driving important new business and technology models. Download the API Technologies eMag where leading practitioners share their experience on making money from APIs and on API design best practices. We discover "cloud native" architectures that scale to meet global demand and get hands on building API's from contract to go-live. We look at connected devices, mashups and consider new standards for security. API Business Models: 20 Models in 20 Minutes John Musser presents 20 API business models explaining how developers can make money with their APIs. Mike Amundsen on API Design, Governance, and Lifecycle Management Mike Amundsen talks about API management, versioning, and discovery. He compares RESTFul and CRUD-style APIs, discusses the notion of 'affordance,' and introduces hypermedia APIs. 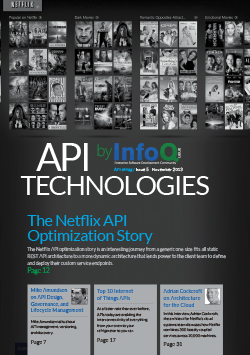 The Netflix API Optimization Story The Netflix API optimization story is an interesting journey from a generic one-size-fits-all static REST API architecture to a more dynamic architecture that lends power to the client team to define and deploy their custom service endpoints. Top 10 Internet of Things APIs At a faster rate than ever before, APIs today are enabling the interconnectivity of everything from your oven to your refrigerator to you car. Learn how today’s top 10 most innovative API’s are changing the way you connect to the world around you. Securely Managed API Technologies Key to Fostering Market Innovation Web services offer distinct go-to-market velocity in terms of real-time innovation, but requires new standards in the way APIs are secured and managed and the nature in which APIs communicate between organizations at the B2B enterprise gateway level. Introduction to Interface-Driven Development Using Swagger and Scalatra Since it began life a little over three years ago, the Scalatra web micro-framework has evolved into a lightweight but full-featured MVC framework with a lively community behind it. Scalatra started out as a port of Ruby's Sinatra to the Scala language. Since then the two systems have evolved independently, with Scalatra gaining capabilities such as an Atmosphere integration and Akka support. Adrian Cockcroft on Architecture for the Cloud In this interview we talk with Adrian Cockcroft, the architect for Netflix’s cloud systems team. We discuss how Netflix combines 300 loosely coupled services across 10,000 machines. An interesting revelation is that they fully embrace continuous delivery and each team is allowed to deploy new versions of their service whenever they want. InfoQ eMags are professionally designed, downloadable collections of popular InfoQ content - articles, interviews, presentations, and research-covering the latest software development technologies, trends, and topics.